Easy to use and powerful expression editor. Detailed and animatable step-by-step solution. Automatic problem type recognition and problem text generation. Extract the problem type from the typed-in expressions only. Generate verbal problem statements from pure input problem expressions. Cover most of the math subjects in PreAlgebra, Algebra 1/2, and Calculus for high school and college students. Helped me get out of remedial math & ending up getting a B+. I'm glad I purchased the full version so I can see every problem step by step. Excellent app and very useful! When u put an integral for example it shows you the answer step by step!! Solutions from the back of the book hardly help. But these step by step solutions do. I learn much better and it makes me want to practice even more. Thank You so much!!! I was searching for a app that would help me out without me having to pay for it to solve or explain. This app goes into details to explain and it's very helpful with problems. I would give this more than 5 stars. I recommend this app if you are looking for an app to help you with homework. I have used this app to review limits and derivatives since it has been many moons since I had it in college. My son is in Calc I and it has really helped me be prepared for his questions. I was pleasantly surprised at how user-friendly it is; however you have to get used to some of the notations. The app does crash occasionally, but not to point I wouldn't continue using it. 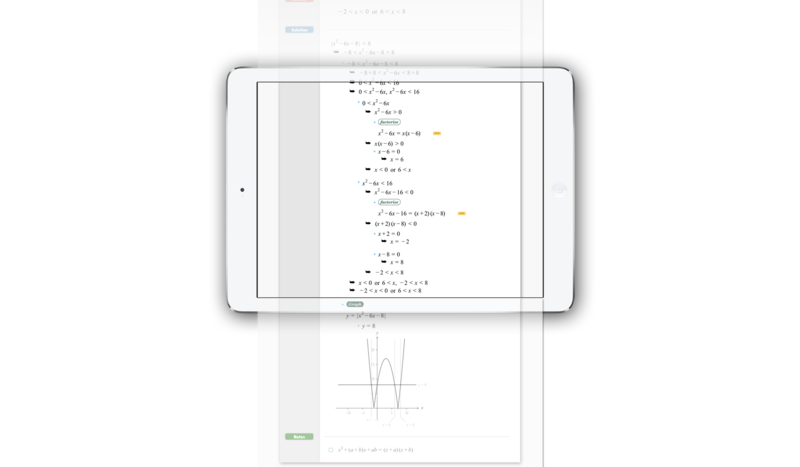 This app would be great for junior high school students through college Calculus. I especially like the play back animation for finding the solutions, nice feature for sure, for adding confidence to any student. I recommend this app. It's great. To type-in a key invisible in the keyboard, hold down a similar key in the same key group. For instance, to type in e, hold down x key in the keyboard, and to type in tan, hold down sin key. Allows unlimited access to the problem solving server of FX Math Solver. Allows to view the solution steps for all the sample problems in the App. FX Math Solver is for personal users(students), and FX Math for Education is for the volumn purchase users like the educational institutions. FX Math for Education does not require to purchase the premium pack for the ulimited server access. Both apps are same in functionality and features supported. 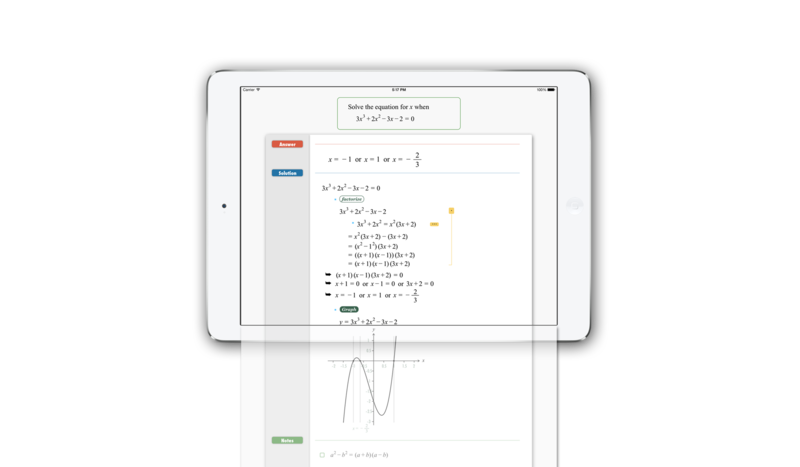 FX Math Solver is for both high school and college students, and FX Algebra Solver is mainly for high school students. 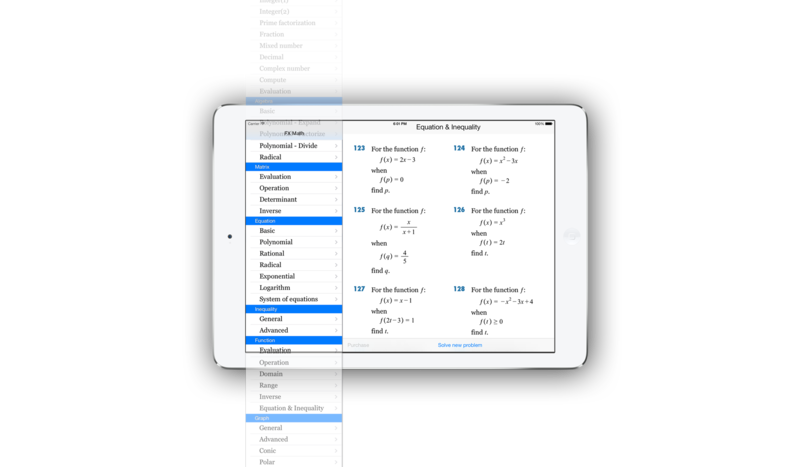 FX Math Solver covers the topics in both Algebra and Caculus, and FX Algebra Solver covers only Algebra 1/2. FX Math Solver do not collect any user (personal) information, including email address, phone number, and user account information of any cloud service. FX Math Solver store the math problem texts, typed in by user, in the application(FX Math Solver) internal storage(sand box) to help user can browse the old solved problems. FX Math Solver do not collect any user (personal) information, and keep no user information to share with or distribute to any third party entity. FX Math Solver send the problem text, typed in by user, to the cloud problem solving server, managed by Euclidus Inc. And the problem solving server use the user typed-in problem text only to derive the answer and solution of the problem for user, and do not share the problem text with any third party entity. You can also email us at support@euclidus.com. © Euclidus Inc. 2014 All right reserved.